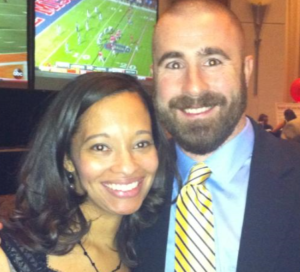 Coach Criner and his lovely wife Stephanie with whom he has two cute little girls. Q: This is your 4th season with Grapevine. Where did you previously coach and for how long? Criner: When I first moved to Texas, I was at Arlington Seguin for 1 year, South Grand Prairie for 5 years, Arlington Martin for 2 year, and this will be my 4th year at Grapevine HS. Q:What is your educational background? Criner: B.A. in Political Science from Oklahoma State University, M.E.D from Concordia University. Q: What is your wrestling background? Criner: In Oklahoma I was coached by Hall of Fame coach Alan Karstetter. Q: What is your teaching field? Criner: At Grapevine HS I teach Outdoor Education. Q: What does Grapevine have to do in order to compete consistently at the state level? Criner: Continue working to establish a winning culture, as well as focus on feeder program building. Q: How much does the feeder programs impact your team success? Criner: Without a feeder program that includes both elementary and middle schools, I don’t think any program can be successful year in and year out. Q: How does your booster club impact your team success? Criner: We would not be able to have a competition schedule that prepares us very well without our booster club. GCISD is a “Robin Hood” school district, this directly impacts our school wrestling budget, without our booster club we would struggle to even provide equipment for our athletes. Q: What are your expectations for this upcoming season? Criner: Last season was the most injury plagued year I’ve ever had in coaching, we lost a lot of kids due to season ending injury or flu. We are returning a lot of quality people this year, if we can stay healthy…we should be a tough team. Q: Tell us about the Grapevine Duals, when is it and who’s coming? The first weekend in January. Criner: We are bringing in a lot of new teams, as well as our returning team champs and Kansas State champs Olathe North. I still think they are the team to beat at this tournament. We will still have other teams from all over Texas and Oklahoma coming down also. There will be some good wrestling. 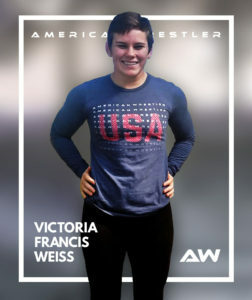 We recently had the opportunity to catch up with 75 kg 2017 US Open Winner & World Team member, Victoria Frances Weiss. This year Victoria had a very busy successful year, she had 2 bronze finishes in overseas competition and she has moved from Colorado to Maryland. She was kind enough to answer some questions for us. AW: As a fan who are your favorite wrestlers to watch? AW: What is the best thing nobody knows about you?